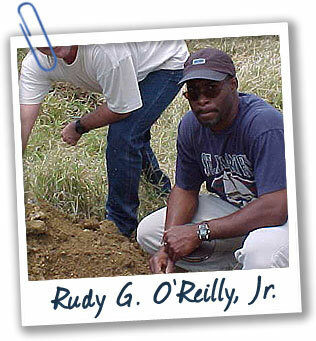 Rudy G. O’Reilly, Jr. works in the U.S. Virgin Islands, where the soil is very shallow and the erosion potential is high. He teaches farmers how to conserve the soil so that they’ll have healthy soil to farm. How did you get started in science? I was one of those weird kids who read the encyclopedia in the dark. I had an aquarium when I was five or six years old. In college, I studied biology and got interested in bonsai trees. Now I have 13 aquariums and a huge collection of bonsai trees. What is your favorite bonsai? The guava berry—it’s a native plant in the Virgin Islands. The fruit looks like a blueberry. It’s used to make preserves for cakes and tarts. I love introducing kids to the natural resources: native vegetation, soil, plants, and water. The kids go crazy for Love Bush! It’s a succulent plant and, according to folklore, if you write someone’s name on the leaf and plant it and the plant grows, that person will love you. The kids want to strip all the leaves off the plant!